Have you done anything recently that’s way out of your comfort zone? In her Tedx Talk “Be a Warrior not a Worrier”, she suggests we all create a personal “Fear Project”. My fear - is being in front of the camera + public speaking. Aside from taking photos, I love helping others elevate their businesses. Whether it’s helping my personal branding clients or helping other photographers. About a year ago, I created an online video program to help other photographers easily create a successful wedding photography business. Because as any photography entrepreneur knows - taking amazing photos and running a business are two separate things. And knowing both is a must for longevity. The biggest feedback I received from my students was they loved the course and they were able to see big results in their businesses. BUT... they wish they would have seen more of me. Why didn’t you see me in more of the videos? For the same reasons I hear my clients tell me… They don’t like having their photo taken or they hate seeing themselves in video. This is something I coach my photography clients through. Coaching that gives them the courage and confidence to get in front of my camera. So I took my own advice. I told that little, critical voice in my head, that regardless of what she says, I'm going to do it anyway. And I’m going to do my best - whatever that will look like. Together, with my awesome assistant Kelly, I got super prepared with everything I could think of - from my message, to the lighting, to camera angles and sound. What I created is an online free 3-part webinar series for wedding photographers wanting to start a photography business or wanting to level-up their current wedding photography businesses. The free webinar will be released next week. Confessions of a Wedding Photographer: Free Wedding Photography Business Webinar. What do you think of the title? Write your feedback or suggestions in the comments below. Preview screenshot from the free 3-part video training series. Is there something you've been putting off or avoiding because of fear? If you started your own Fear Project, what would it be? Tell me in the comments below. Have you ever felt like your marketing is lacking? That you could be doing something more, but you're just not sure what? Do you feel like you may be missing some things in your social media, your website, or in your brand? I’m going to share with you 4 of my secrets to marketing that you can do THIS WEEKEND!! One weekend of work can transform your website and attract future clients. And.... did I mention these 4 things won't cost you a dime? You don't need to buy anything! Did you know that “About pages” are one of the TOP 5 most visited pages on websites? That’s huge! But surprisingly, most us overlook this page ... or we just throw up some generic (useless) information. Truth be told, I fell into this grey zone myself. But once I realized this, I discovered my about page was one of the most transformative pages that pursauded potential clients to contact me or not. Why? Because, it solidified the KNOW, LIKE and TRUST factor. Action Plan: Rewrite your about page in an interview format. List 5 questions you wish prospective clients knew about you and 5 questions prospective clients usually ask you. Now write the answers to these questions. If you find writing about yourself difficult, this is a fast and easy method to keep the tone conversational and personal. Have you ever heard it takes 90-100 days to achieve something? This is a common timeframe we worked with - back when I worked in the corporate world. So what do I want you to do here? Action Plan: grab a piece of paper and dot out a high level overview of who you would like to attract in the next few months. Come up with a message and share images that compliment your message with the world. People buy from people they like. Even big brands are getting personal. Think Apple and Steve Jobs. Be sure to sprinkle in some personal images and stories to give your brand some life. Prospective clients want to know if they’ll like you, feel comfortable with you, feel safe with you and if they’ll enjoy working with you. On the same note, know that not everyone will click with you. But this will help in attracting the right clients and repelling the wrong ones. You may be thinking this is an obvious one. But when was the last time you actually updated your testimonials page? Prospective clients want to know what other people thought and felt about working with you. Hate asking people to write a testimonial for you? (I do) Don’t worry! Look back in your emails. Have previous clients said nice things to you after a shoot? Simply send them a quick email asking if you can use their words on your website, social media and marketing materials. & sales tips right to your inbox. We'll be opening the doors this week to the wedding photography e-course: Stand out. Save time. Sell more. But before we do, I'm giving away 3 scholarship spots. Winner will be selected Monday, November 20th! We’re giving away 3 FREE SPOTS to the this awesome 5 week online course! Simply COMMENT below this post describing why you'd like to win. Go to my Instagram page and LIKE the Giveaway post, COMMENT why you’d like to win, and TAG anyone else you think would like to enter. Join our free Facebook group. Then LIKE the Giveaway post, COMMENT why you’d like to win, and TAG anyone else you think would like to enter. The winners will be chosen Monday, November 20th, 2017. Wishing you so much luck. I hope you join us and we'll see you in the course! If you'd like to get on the e-course waitlist - and be the first to know about early bird specials sign-up here. P.S.S. For more information on the course here. I hope you'll join us! I JUST WANTED TO LET YOU KNOW THAT SINCE I FINISHED YOUR TRAINING, I JUST KEEP THINKING ABOUT YOU NON-STOP! YOU DON’T UNDERSTAND HOW REVOLUTIONARY YOUR TRAINING WAS TO OUR BUSINESS. AND THAT IS COMING FROM PHOTOGRAPHERS WHO HAVE SHOTS CONSISTENTLY 25-30 WEDDINGS PER YEAR EVERY YEAR, FOR THE PAST 5 YEARS, PRIOR TO TAKING YOUR COURSE!!!! 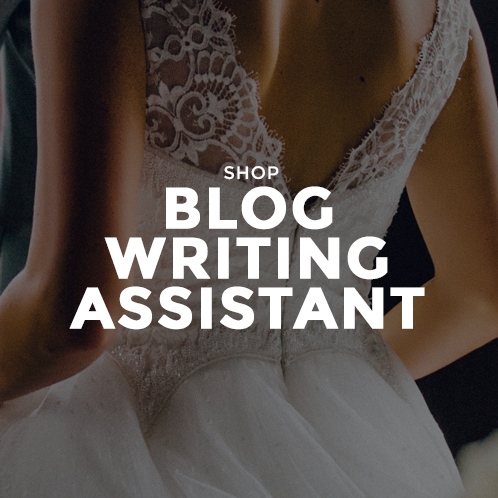 THERE WERE SO MANY PIECES THAT I WAS ALREADY APPLYING WITH THE SALES PORTION/CONSULTATION PIECE, AND THE ‘KNOWING YOUR UNIQUENESS PIECE’, BUT YOUR TRAINING HELPED JAQUES AND I LITERALLY RE-BRAND OUR ENTIRE WEBSITE, PRODUCE AMAZING CURATED BLOGS, AND BE ABLE TO WRITE OUR BLOGS VERY FAST WITH THE USE OF THE BLOG ASSISTANT. IT’S HELPED ME A LOT. EVERY TIME I WRITE UP A BLOG, I THINK OF YOU; AND EVERY TIME I BOOK NEW CLIENT AT OUR NEW PRICING, I THINK OF YOU TOO! I CAN’T THANK YOU ENOUGH, GIRL. THANKS TO YOU WE’VE BOOKED 8 NEW CLIENTS WITH OUR NEW HIGHER PRICING IN THE PAST 6 WEEKS, AND I AM SO GRATEFUL. I’M HOPING TO RUN INTO SOON JUST TO HUG YOU, LOL! This is not your traditional wedding photography business e-course. This e-course teaches you how to improve your online presence so you can spend less time on testing-out what works and start getting measurable results every week! This course is a shortcut to transform (or start building) your wedding photography business into a personally fulfilling, profitable and sustainable business. Reconsidering (Wedding) Photography as a full-time business? You started off your wedding/portrait photography business super motivated with dreams of success and plans of living your passion. You felt elated and unstoppable. You had several requests for your photography services. This was going to be amazing. The fire, zest and motivation within subsided. • or you’re just tired of the hustle. Is it over? Or are you just in a temporary rut? Most of us can safely say, we’ve all felt like that one time or another. Things have changed. And you can’t understand why. Is it the industry or is it me? Ok probably not that drastic of a change. But how can we stay relevant? How can we keep our services in demand? In my experience, a check-up in these 5 core areas has kept my business in-tune while adapting to the changing market. "anyone who is getting married next year that lives in my city." Ok, that’s a good start. But let’s get a bit more specific. Tell me, are there clients you’ve worked with in the past who you absolutely loved working with? Who are they? Where do they hang out online and offline? For me, when I started my wedding photography business 8 years ago, almost all of my brides were hanging out on Facebook. Back then, posting images on my FB business page got a huge response in likes and comments. Fast forward to today. For the most part My FB business page is pretty quiet - unless I pay to promote my posts. So I said to myself - people are obviously still getting married in my city - where are they hanging out online now? Answer: Instagram and Snapchat. Another example is, you are a wedding photographer who is trying to attract brides who desire outdoor weddings. Take a look at your branding and your website: are nature and outdoor wedding images a prevalent theme on your website? If they aren’t - make changes to get it in line with who you want your ideal client to be. ACTION: Go further in-depth with who you want to work with. Try to figure out everything about them - and then tailor your brand and marketing to attract them. Let’s get real honest for a moment. How persistent and consistent are you being in promoting your business? Has the number of inquiries you usually get dropped? Or are the inquiries you are getting not booking? If so, it’s a good time to do a check-up on your persistency + consistency to ensure they’re aligned. First, let's look at persistency. Have you been putting your business out there everyday? (And I don’t mean doing something difficult or overly time consuming). I mean like posting on social media, putting an update on your website, or going out and talking to people about your business. It’s a known fact that people buy from people they like. Does your audience know you? Can they relate to you? Do they like you? Do they remember you? If you aren’t getting any quality inquiries, go to your social media. When did you last post? And how long before that post did you post? I recommend posting on Instagram once day or once every 2 days. You can plan out your posts ahead of time so it doesn’t become a chore! I used Adobe bridge or my album software to design my consequence ahead of time. Now let's look at consistency. If you’ve been posting on social media all the time and you’re still not getting any busier, let’s take a closer look at what you’re posting. As with your brand - the goal of your social media posts is to represent your brand visually and textually. If you’re on Instagram, make your 9 squares look pretty and have them complement one another. You are in a visual business after all - people will be judging the first impression of your feed. What are you posting? Back to our last example, if you want more outdoor weddings, post images related to and showing the outdoors. And if you want to book weddings, don’t post photos of babies. In other words don’t post what you don’t want. Post only what you do want. Action: Post to social media often. Focus on one platform where you are seeing results. It takes time and persistence to get a following. For Instagram I recommend 1/day or 1/every other day. Keep the posts on topic and make them look beautiful. You can avoid being overwhelmed by planning them out ahead of time using Adobe Bridge or your album design software. Yes that’s most likely true. But again we are looking for something more specific. One tip to figure out what your strengths are - or what your clients see as your strengths is to go back into your client email correspondence. Usually right after you post a client’s image online or provide them their photos, they’ll write you an email to say thank-you. Open up those emails. What else did they say about your work - or about the experience of working with you? What is something my client saw or noted? I’m patient. I don’t rush them. I care about them. Something went a little off schedule on their wedding day and I stayed to capture it even though it was outside our contract and over and above what was expected of me. ACTION: Take a look at what your previous clients have said to you or about you. Then weave those strengths into your marketing text -- and into your consults! Now let's look at what your prospective clients need or desire. Do you know what they need? They need, photos, prints and maybe a wedding book right? All true! But what else do they ask you for? For example clients often ask me for, high resolution digital files, canvases, video, video slideshows, bridal shoots, boudoir shoots, engagement shoots, rehearsal dinner coverage, shower coverage. Now check your current packages and price-list - are you offering what they’re asking for? For example are you still offering a DVD of images, when clients are asking for USBs or digital cloud storage? Listen to what they are asking for, don’t assume. These are the specific items you should have in your packages. Tip: Include a big bundle of them in your top (dream) package. I go into great detail in the E-course on how to create packages that sell. Take steps to include the specific items your clients ask for in your packages. Are you busy watching your competition and trying to figure out how you can keep up - or do the same? Before going any further, remember you’re always going to be second best if you try to copy someone else. That being said, wedding photographers specifically, are all offering similar products. Digital images, prints, wedding books etc. So what or how are you doing that differently from everyone else? do you consult with your clients regarding wardrobe for their engagement session? do you help create their wedding day schedule? do you offer a complimentary 1 year anniversary photo shoot? does your background as a fashion photographer help with posing your clients so they look beautiful? The goal is to stand out and be memorable for what makes you different and unique. Action: Take a moment and make a list of what makes you - YOU! Then work those unique and amazing things into your brand and marketing - textually and visually. These things should be loud and clear! Not something someone needs to dig out to discover in your FAQ section. Or something someone discovers in the last paragraph on your about me page. Be obvious and make it beautiful, i.e. through photos or blog titles! Go through your website and take some inventory - is it obvious to your visitors on what makes you different in your approach, service or products? I hope I’ve given you some fresh eyes to see how your potential clients currently see you - and how you can make simple changes to get more bookings from your ideal customers. If you’re stuck in a rut, this 5 step quick exercise should shed some new light on what’s going on. If you’d like to take these concepts deeper, join me in the E-course: Stand out. Save time. Sell more. Registration is now open - more information here. Or start out with my FREE 3-part training series: Confessions of a Wedding Photographer first. Remember information without action futile. I’d love to hear your comments. Did anything spark a change in you, your business or your online identity? Share with us in the comments (way down below)! Thanks for sharing your time with me today! Leave me a comment below - what was your breakthrough moment? Pssst - if you’d like to go directly to the free training click the button below. The surprising reasons why some wedding photographer's websites are successful and other's are not. And when I say successful, I mean websites that work to book more of your ideal clients while saving you time. Why is it that people struggle with getting their true or authentic selves across online or on their websites? Can you tell us more about these three categories, so our readers can see if they fall into one or the other? Absolutely. Before I describe each, know that doing any of these things is not necessarily bad. The message is that, you could be doing more to build a deeper more relatable connection with your visitors. The Essay writers, write more a formal piece. The text sounds more like something they’re going to hand into their professor, than something their clientele can relate to. It often comes off as cold and technical. These writers may also use terms, specific to their industry, that their website visitors may not understand or be familiar with. The Vague ‘blend-in-with-the-crowd’ writers, tend to state general information and not elaborate a great deal. For example, these writers will state they are a husband and wife team, their style is photojournalistic and they’ve won XYZ award and been published in XYZ magazine. The end. The Cutesy Casual Writers will try to be cute, funny and keep things light. For example, they talk about how much they love their little fur ball named Kenny (their kitten/family member). Their favourite colour is blue, favourite food is sushi, and they like long walks on the beach. I know we’ve spoken a lot about writing so far. But you teach that there are many additional factors involved in projecting your authentic self online. Could you mention a few? Yes, there are factors in addition to the text on your website that can also make a huge difference in whether your visitors will know, like, trust and ultimately want to buy from you. Your use of photos, which photos you use, how many photos you use and how your photos are presented are a factor. Also, does your website have a deliberate flow that purposefully guides your visitors through to booking you? How easy or confusing does your website appear? And how long are you able to keep people engaged on your website? These are just some of the other factors involved. Using this knowledge, you booked yourself solid (year after year) only using your website, while you lived on another continent. Is that correct? Yes! My husband’s career had us move our family all over Europe for spans of 6-9 months out of the year… every year. When I returned home, I’d have my schedule booked solid for the 3-6 months. While away, I couldn’t meet clients face to face. And it was often difficult to talk to them because of the time differences between countries. So, I designed my website to handle the heavy lifting in selling ME and why I would be a great match for them. My website essentially turned my visitors into clients. When they contacted me, they were already ready to book. I know these concepts work and they work well! My website is like my second employee or an extension of myself who works for me 24 hours a day, 7 days a week. To the untrained eye, many people may not notice when websites have any of these elements in place. How did you learn or acquire this knowledge? I’ve pulled much of this information together from my formal education, work experience, and good ‘ol trial and error. I have my Hon B.Sc. degree in Psychology and I did my postGraduate university studies in E-commerce and Web design. That coupled with 10 years of experience working for advertising agencies in Canada and Europe with high profile clients such as Mastercard, Eurocard, Kraft, Opel, Thomas Cook travel to name a few. There really is a method to the madness, for every brand, behind the scenes. This is what makes us feel a certain way when we see the final product, brand or person. Why is it, do you think, that most websites don’t stand out or don’t work? Most people focus on doing the same the thing their competitors are doing online. Most websites tell the same or a similar stories. The thought process is - well it must be working for them, so it should work for me too. Or people think they’re boring and they don’t have anything special to tell. That is, they don’t tell their unique story. (I teach you how to find this voice and your unique story in the E-course). The reality is that most brides begin their search for their photographer and other vendors online. You won’t stand out, and you won’t be memorable, if you’re trying to be like or sound like everyone else. I know your E-course guides your students to stand out online, in every way, but could you share a few tips with us today? Absolutely. I’ll also be sharing a few of these tips in the free training module on January 19th. The free training will give the audience a little taste of what is included in the E-course. So one easy tip is, how you are using your website’s “About” page. The About page is one of the most under-utilized pages! Makes your visitor feel like you're both are in-sync. You’re reading her mind and you’re both on the same wave length. You’re not just talking about yourself, you’re talking about how you can help her solve her problem and how your services can benefit her. You save your valuable time and hers. When this client contacts you, she’s less likely to still be in the research phase and more likely to be in the booking phase. Will content in your e-course become dated, obsolete or break if Google decides to change it’s algorithm again? Oh no! The concepts you learn are definitely not ways to cheat Google! They are authentic, smart, and best online practices. They have nothing to do with Google’s algorithm. These changes are grounded in best online practices, from how to make your website load faster, to how to sell yourself and your services honestly without yucky sales-y techniques. This training is not about trendy SEO hacks! Who will benefit from taking this course? Wedding photographers, wedding florists, wedding venues, wedding DJs, wedding videographers. Anyone in the wedding industry who wants to increase their number of clients while doing less work will benefit from this E-course. Could you give us some specifics on how will this E-course benefit us? This E-course will get you more “ready to book” inquires from your ideal clients. Often times, the clients contacting you are simply inquiring to price-shop you. That is, they will pick the least expensive vendor who can do the same job. If you present yourself like everyone else, you’ve turned yourself into a commodity - someone who can do the same job, the same way as someone else. And this is why you’ll get clients who will select you purely on price. The main benefit of this course, is that you’ll be positioning yourself away from competing on price. You’ll be changing the conversation and attracting inquires simply because YOU are a great match for THEM. I know some people are wondering, do you need to be “techy” to apply what you learn in this E-course? Not at all. The steps I lay out anyone can do. You just need a website, such as a Squarespace website or a Wordpress site, and the ability to login and make changes to get started. If someone is just starting out, and they want to take your E-course, but they don’t have a website yet, are there some website companies you would recommend they check out? Well, I haven’t tried all of the website companies out there. But, of the ones I use, I would highly recommend Squarespace (very easy to setup and use) and Flothemes or Prophoto for Wordpress. Again, the how-to of setting up a website is outside of the scope of this E-course. Coming into the course, you should have an existing website, or be in the process of setting one up. To wrap up - what will be the biggest take-away for people who take your E-course? If you apply the concepts taught in the E-course, you will stand out and be perceived as the go-to leader in your industry. You’ll save time by educating your visitors ahead of time dispelling any skepticism or objections they may have. Your visitors will feel as though you’re both in-sync from their first impression of you online. And lastly, you’ll inspire them to book and buy from you. Is there anything else you’d like to leave us with today? A study done by Dane Sanders (his book the Fast Track Photographer) found that 60% of photographers give up their businesses within the first year. Then of those 40% still standing, another 25% will drop off within the 2nd year of business. That leaves only 15% still operating in their 3rd year. That is a distressingly small percentage. Some of the main factors (among other issues) involved in the demise of these photographers, in my opinion, are a lack of visibility or standing out from the crowd, a lack of sales, and pricing that isn’t sustainable. All of these subjects will be taught in the E-course. I hope you’ll join us. It’s going to be an eye-opening and results driven experience. I’ve got some honest words, a profitable message and some valuable freebies for you today. It was your average Friday, I was editing photos and listening to a new audio book, when something I heard stopped me dead in my tracks. Something put so simply. Something so resonating. Something so important. Something I realized I learned over 20 years ago but could never articulate into words so simply or powerfully. I was 18 years old and I got a part-time job at a trendy clothing store while attending university. I had no sales experience, but I guess I looked the part. To the interview, I wore my most stylish outfit. I was hoping to be perceived as cool or fashionable enough to work there. The first day on the job I was told to go sell some clothes. I would be paid a low hourly wage in addition to a 3% commission on anything I sold. I noticed quickly how hungry my fellow salespeople were. The deal was, once you put clothing in the change room for a customer - that customer was considered yours. And you would receive commission on anything he/she purchased. I was instructed to go greet the customers. To go tell them how good they looked the clothes. I was also given some other scripts aimed to pull in some sales. I felt really nervous. Actually, I was pretty scared. I didn’t want to approach customers who clearly didn’t want any help. (And this was pretty much everyone who walked into the store). Using the sales techniques felt 'yucky' and 'salesy' coming out of my mouth. Then a whole month went by… and still I made no sales. I knew my job security was running thin. I could tell management was getting frustrated and annoyed with my performance. My next shift started, and for all I knew, it was possibly my last. It was quiet day at the mall. A girl came into the store and I said “Hi”. Without any thoughts of making a sale, I started organizing some messy sweater piles near where she was browsing. We struck up a conversation. It was a natural conversation. It felt legitimate and equal. As the conversation progressed, the tone remained the same as the topic transitioned. She told me what she was shopping for. I enthusiastically showed her all of the items that matched her needs. And then, I showed her all of the amazing accessories and other items (I personally thought) paired well with the outfit - to take it from good to great. I loved helping her. It was a magical feeling. And coincidentally, she too was getting excited about my suggestions. I poured 120% of my heart and soul into presenting her with the best solutions to her problem. And she looked great. I’m sure you can guess the outcome. Yes, I made my first sale… and it was a BIG one. But it was a win-win. We both felt happy and fulfilled. Au contraire! I was focused on how I could help this lovely customer and create the best looking outfit to match her needs. Things turned around that day. And from that day on, I was the top producer for that clothing store. The moment I became a real person and had a real conversation with that customer, was the day I realized that sales aren’t about one-liners or savvy selling techniques. No, it was about me being able to be me. It was about how I could relate, help and give my customer something valuable and specific to her needs and desires. It was about how I could make her happy and exceed her expectations. Although, I learned this important lesson over 20 years ago, it was a feeling I never forgot, even though I could never quite articulate what it was in just three little words. Just be a real person. It doesn’t matter what you’re selling whether it be clothing or wedding photography, the same principle applies. It’s the law of authenticity. I live my life and run my photography business by this law. Now, if you’re wondering what this amazing book is called, it’s called “The Go-Giver, Expanded Edition: A Little Story About a Powerful Business Idea” by Bob Burg , John David Mann. It’s a quick read with a big impact. You can read the first 2 chapters for free on google books here. I’m hoping this inspires you To connect with your clients on a deeper more authentic level to ultimately jumpstart or build-on your current success. Now, I’ve got a lovely surprise! It’s one thing to create deeper more authentic relationships with your clients face-to-face or on the phone. But often times we struggle with creating this same feeling online. In other words, does your website present the real you to the world? I know how mechanical writing about yourself can feel. You’re thinking…. “Do I sound too corporate?”, “I don’t want to sound conceded”, “Does that sound unprofessional?”, “Which photo should I include?”. This month I’ll be hosting a free online training module covering some of the most overlooked things you can do to your website to help you stand out, save time and sell more. The free training video is geared toward wedding photographers and other wedding professionals. The wedding industry is super competitive and highly saturated. And, let’s face it, most brides begin their wedding vendor search online. This free training will give you some quick action items you can do to make yourself stand out from the busy crowd. Thanks for allowing me into your inbox! Leave me a comment below - what was your breakthrough moment? P.S. I mentioned that I was listening to this book while editing photos. I subscribe to Audible (where you can find this book) and Sue Bryce Education. Both have business material that is motivating, insightful and inspiring! Update: The consultation kit is now available in my store here. Download period ends today, Wednesday, August 31st at 5PM EST. I have a special surprise FREE GIVEAWAY I’ll only be sharing with those who are on my mailing list! You still have time to get on the list! And be sure to check your email and click the link to confirm your list request! If don't confirm your request, I can't add you to the list. If you want to incorporate a profitable Personal Branding strategy into your studio, you won’t want to miss this. A a couple months ago, I added my Personal Branding Photoshop Template to my online store. The idea to create the template, came after I did an interview with Sue Bryce, and we spoke about how I market & sell corporate headshots (a.k.a personal branding shoots). This led me to writing today’s article - to share with you all the things I wish photographers knew before shooting corporate headshots/personal branding. All the things I wasted a lot of time learning - the hard way! Because every client and every business is unique and needs to stand out from the competition, it's imperative you chat (in-person, or on the phone) with your personal branding clients before photographing them. Ask specific questions about your client, her business and where she wants to use her photos. Be sure to take notes and use those notes to plan out your photo shoot (see #5). (Having trouble making suggestions on new places where your client can use their photos? Check out the Photoshop Price-list Template for ideas). Similar to point number one, do your leg work before the consultation. Why you ask? Because it’s important you be specific and take a personal interest in your client. With personal branding one size does not fit all. If you have a consultation before doing any initial research, you won’t be prepared and your suggestions, if any, will sound very generic. Show your client that you're taking an interest in them personally. 1. Is she currently using any personal branding photos? 2. If yes, where is she currently using her photos? 3. Where might she be looking to update them? 4. Where could she be using them - but is currently not? Gather as much information on where your client is currently using her photos and note where she could be using them in the future. An inconsistent price-list is a price-list where the same product is priced differently across different genres. Let’s say you sell 7x10s. And you price a 7x10 for family portraits higher than a 7x10 for corporate headshots. Why are they priced differently? Is one 7x10 better than the other? This is why consistency is important: let me tell you a story where this became a big problem for me. When I started out in this genre, I was charging really low prices for my corporate headshots. Lower than my glamour portraits. I told myself I was getting clients in the door. The problem arose when my headshot clients would bring in a couple of gowns to shoot at the end of the session... "just for fun". The photos with the gowns would usually qualify as a portrait or glamour photo. When the client came in to select and purchase their photos, it seemed ridiculous to charge one amount for the corporate headshots and another for the glammed up photos. Having a consistent price-list across the board solved this problem. Now, I’m not saying have 1 generic pricing brochure for all genres. No! Absolutely design them differently target each market you shoot. But keep your pricing the same. What kind of checklist you ask? If you’ve you’ve done your pre-consultation research and had your in-person or telephone consultation, you can easily put together a shooting checklist. Where your client may try using their photos in the future based on your suggestions. For example, if you client is going to open a Facebook business page, you check off vertical/square profile image and horizontal image for the cover image. And shoot to fulfill those requirements. Your checklist will act as a photo shoot planner. Many of us were taught that to be in business we nee to fit a certain look or mold. When shooting personal branding photos, I suggest getting a few safe photos at the beginning. But be sure to branch out and capture your client’s authentic self. From your pre-consultation to your in-person or telephone consultation, you should have a good idea who your client is and what they’re trying to express to the world. Aim to capture all of this your shoot. Then branch out and get creative to capture your client’s true self. I hope you found this helpful. Leave me a comment below. P.S. If you know someone who will find this article helpful go ahead and share it with them! Are you thinking about incorporating WEDDING photography into your studio? And you're interested in how you can easily build a profitable wedding photography business. Check out the coming soon: E-Course: For those with a creative background not a business background - how to easily create a successful and profitable wedding photography business. Spring is already here for those who live further south. Last week I had the opportunity to visit Nashville, TN. With the family in tow, and camera in hand, it was a fabulous trip. I think I even got a bit of a tan! See my Instagram feed for pics from the trip. While on my trip I got to meet an awesome stylist, Krista Roser, who styles many of the young country stars. And I got to hear how others are using their social media accounts to generate income. All of which got me thinking about how I've used blogging + social media to keep my calendar fully booked. (I outline the super simple steps below). I've never needed to invest in any advertising or do any shows/expos. Truth be told, I've invested in advertising twice. Approximately $1000 each time. Once was for a listing on a local wedding website. And the other was on a national magazine's website. The latter got me 3 out-of-town jobs. I don't search for ideas or try to brainstorm new ideas of what to blog about. I blog about my clients. I use the photos I have created and sold to my client for the core of the post. Then I add a little story around those photos. It makes your current clients happy. The blog post makes them feel special. Heck, I feel special if my work gets featured anywhere! Your clients feel the same when they are featured on yours. Often clients are more excited about their photos being posted online, than they are about receiving their albums or digital files. They're excited because they want to share and show them off. So having a well curated blog post + a story shows your client in their best light. Now onto the psychology of how blogging about your current client actually attracts new clients. Suspicious - according to socialmedia.com "buyers are naturally suspicious". If they see someone they know has purchased from you, they become more trusting of your product and services. Best choice - other times buyers don't have time to shop around. They assume those before them have already done the research and selected the best choice. According to research conducted by Forbes magazine, "we copy people we know because we’re simply uncertain about the best choice". Fitting in - according to Psychology Today magazine, sometimes clients purchase from the same company to "imitate others and fit in". Success Stories - if your work has aided in your client's success - success stories have an immense impact on consumers, according to socialmedia.com. Now that we know how and why it works - how do we get people to our blogs? All roads lead back to your blog - and timing is of the essence. When to create the blog post - create your client's blog post before releasing any digital images. Here's the process: you've completed the photography job for your client and he/she has paid you. You are ready to deliver the photos. Before you do, put together their blog post and send them the link. This ensures your client will share the link with their friends and family (not the other products you give them). Announce on Social Media - announce on any and all of your social media platforms (Facebook, Instagram, Twitter etc.) that you have a new blog post up on your site. Be sure to include the blog post link and post a photo to peak interest. Email your client - email the blog link and social media posts to your client. Encourage them to tag themselves and share the post on social media. ASIDE - I know you do this already, but I want to remind you to have your clients sign a model release before posting any of their images online. TIP - I also let my clients know ahead of time that I'll be writing a special post about them on my blog. This gets them excited. Or, if they are super private people, they have to chance to let me know that they are uncomfortable. If you'd like to take these concepts further and dive in deeper on how you can easily build a profitable wedding photography business, check out the E-Course: For those with a creative background not a business background - how to easily create a successful and profitable wedding photography business. Are we unknowingly diluting our brands? In a world where websites are often the first touch point our clients have to us - are we dressing our sites for the job we want or the job we have? When we dilute our websites we automatically attract the WRONG clients and repel the RIGHT clients. Let me elaborate with a story before we get to the action steps. Sandra, a fellow photographer, recently told me she couldn’t get any clients... and the few clients she did get purchased very little. She went on to tell me how she went to networking meetings, had a booth at a show and invested in paid advertising. And the result - a negative bank balance. So what was going wrong? Now, there could be several things wrong, but I started with her website because this is where our potential client's start. The first was, Sandra is a fine art wedding photographer. Her homepage displayed 2 fine art wedding images, and then, a baby photo set in an outdoor park. (Insert record scratch sound effect). The style clash stood out like a sore thumb. I asked Sandra if she does baby photography. Her answer, “I don’t want to.... but it pays”. The second problem was, sprinkled throughout were unpolished, amateurish photos. These photos were not consistent with the quality of her best work. I asked Sandra about the unpolished photos. • ATTRACT: What you show on your website you will attract. If you put baby photos, you will get requests for baby shoots. If you don’t like shooting XYZ… don’t post XYZ photos. If you’re shooting a genre and your heart isn’t in it, that will show in your work and in your sales (or lack thereof). • FLOW: Make sure there is a flow to the style of the photos you post. Don’t be all over the board or clients won’t be sure what they’ll get if they book you. If you have different styles, transition to them slowly in your gallery so you don’t throw visitors for a loop. • A+: Only show your best work! Edit your website and remove any photos you dislike or you think are just “ok”. If they don’t score an A+ take them down. If a potential client comes to your website and sees 2 great photos and 1-2 mediocre ones they won’t be confident in your abilities. And they won’t contact/book you. Don’t give them a reason to hesitate. • FOCUS: Potential clients don’t care if you’ve been a photographer for 10 years or 10 minutes. If you can make them look good or fulfill their needs they will contact you. Remove the photos from your website of work you’d rather not do in the future. Only post photos of what you want to shoot more of. Post only your A+ images and delete the others. Don’t dilute your best work with your less-than-best work. Remember, clients come to your website because they want to book you! They are hoping you are a good fit for them. It's okay to repel the wrong clients. But don't repel the right ones! I’d love to hear from you. Have you found you're diluting your website in other ways? Share with us in the comment section (way down) below. P.S. Share this article it you found it helpful. P.S.S. After writing this, I realized I have one super cute baby photo (that I am so proud of) on my website. I don’t shoot babies but sometimes get requests. Lightblub: I think it’s time to take it down! Animoto Video - Yay or Nay? So I did it! I took the plunge signed up for Animoto and created a video! Now I’ve heard people in the photography industry singing the praises of Animoto for a while. Namely the super talented Sue Bryce! And I must admit, my initial reaction was how great can it really be? I mean I use a Mac.... and iMovie is simple enough. I’ve also tried Photodex Proshow Web. Could this really be any better? - I said to myself. Well, at the end of this article I’ll tell you the reasons why I think Animoto is a better tool - for my needs - and they probably aren’t for the reasons you think! I’ll also touch on some different ways you can use video for your wedding, family or glamour photography businesses! But first let’s start off with why video is even important to your photography business! visitors who watch videos tend to look deeper into your product/brand and later purchase from you. So video is pretty important. But how can we use it in our photography business? That’s all great, but where can you use these videos? Uhm… just about everywhere! And the best part is you can easily re-purpose your videos. Think - homepage, blog post, Facebook, Instagram and other social media. I wanted to surprise one of my beautiful portraiture clients with something extra thoughtful. My typical portraiture blog posts prior to this, I’m sad to admit, were 1-2 images from a photo shoot that I would post here and there if I found time. This time I wanted to say more. This time I wanted to show more. And I wanted to say more without words and without just throwing a bunch of photos up consecutively one after another. So I logged into my Animoto account and I picked a theme that I thought would be fitting with the style of photos I wanted to showcase. Tip: when viewing the themes, try to look past the default placeholder images - your photo genre may give the theme a completely different vibe. Animoto, automatically timed my video to the music, transitioned between the different slides and gave me straightforward options to export/publish my video. Since you can control the time of the video, (if you’d like), you can also make shorter complimentary videos to use on Instagram. Tip: Instagram cuts videos off at 15 seconds. So in addition, I made a shorter 15 second version of the video to match the look & feel of the original video. Then, with the touch of a button, I exported the videos to my youtube and vimeo accounts and also downloaded them to my computer. And the very best part... my video looked ultra professional! All shiny and polished! iMovie and other online video programs can do the same thing right? it saves me time! I’m a photographer and I don’t have time to fiddle around with video software. it has a blank template that you customize for projects that don’t fit with any of their other themes. If you’ve been considering using video for any aspect of your photography business, I hope this article has been useful! I’d love to hear about your experiences! Also, if you want to explore more about how to use animoto to boost your business check out Sue Bryce's super Creative Live course here! Be sure to leave me a comment below.